Quick question (no googling people): where is the largest oil reserve in the world? I am all for green energy. Can you imagine how nice it would be if the US didn’t have to deal with the crazies in the Middle East? How about clean, shinning solar panels giving us everything we need without all the dirt and risk of oil? Did I mention that I’d love to have a tree that grows money too? Back in the real world we keep pouring billions of dollars into companies that are simply not viable. How much will we keep looking for something that simply is not there yet? The one argument that I respect about green energy is the fact that oil is finite and we eventually need a replacement. But the question is: how soon? That is not just an important question… That is THE question in this whole debate. Is the search for a replacement something we need to figure out now? In 50 years? or in 150 years? So I took my family to Moab, to visit the Arches National Park. On our way there, we stopped by this ‘Prehistoric Museum’ which is maintained by the College of Eastern Utah. It is a small but tidy place, and the visit was surprisingly interesting. Lots of Dinos used to roam around here. 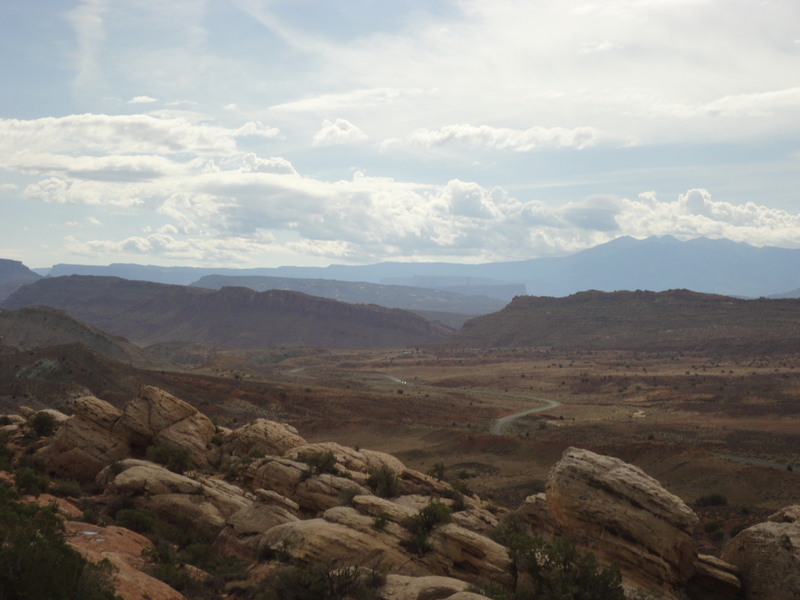 And this big desert was not always so dry… Have you ever heard about the Mancos Sea? Me neither. Have you ever heard about the Green River? Now, if you did Google for ‘Oil reserves’ you probably got this. The so called ‘conventional’ reserves, which show all the usual players. But how about typing “Oil shale reserves”? Hmmm, quite a different picture isn’t it? The Green River Formation is by far the largest in the world. Even if only half of it can be extracted, that would amount to nearly triple the oil reserves of Saudi Arabia. Of course, this type of oil is hard to extract. The latest figures I’ve seen show that it would only make sense after we get to a $200 a barrel. But the question is: so what? Are we going to be ready to switch to solar or wind once oil hits that price? Do we need to keep shoveling money into solar panel research or should we be looking into cheaper and better ways of getting that shale oil out of the ground? Why we don’t have an open and honest debate about this? Is the global warming agenda that powerful? Why even Republicans only talk about Alaska when the real deal is not there? Here are more pics from our visit. Current best estimates are that oil from oil shale is potentially profitable at $38-65 per barrel (see Oil and Gas Journal article in January 2009). However, large investments would need to be made, and these will likely proceed slowly. It never pays to bet on the government moving too fast either, but oil shale will not be a major supplier for some time to come. It certainly deserves thoughtful consideration in our future energy mix. What is needed is both investment by companies and regulatory streamlining from government. What I don’t understand is why these large investments we need upfront are not being considered as something that should be done faster. Why is the Federal government (who already owns most of the land where the oil is) is not at least trying to move faster? Would a few extra billion that are currently dedicated do solar panel research make a difference? Just looking at the numbers, this doesn’t look like something to be ‘part of the mix’, it looks like a potential game changer. Can you imagine how much noise we would be making if suddenly we got handed all the oil in Saudi Arabia? Thanks for the question, and sorry not to get back here sooner to reply. To me, the main thing the government should do is work, together with a wide range of stakeholders including the companies interested in oil shale, to put together a realistic plan for how oil shale could be developed to provide adequate return to the companies making the very large, long-term investment, to protect a moderate number of critical environmental priorities, and to give the people some reasonable share of the revenue in royalties. The large capital investment will be well beyond what the government could really do. A few extra billion from the government might help support research at National Labs on frontier questions, and at universities like mine (my opinions, not University positions here). There is still a good deal of work to be done to test the in situ methods, and some to ensure that the more developed surface processing methods are engineered appropriately for the specific oil shale properties in the Green RIver Formation. Companies are already doing this without asking for government subsidies. What is really needed is to ensure steady growth over the long term. Most people think that shale gas jumped into being in the last few years. But shale gas production has grown at a steady 15% per year since 1991 – twenty years to break out on the global scene. A lot of that growth went on quietly in the background, without crash programs. And now, by this means, it has arrived at game changer status. Oil shale has the potential, even in the current climate of some uncertainty (in the U. S. at least), to increase in production by more than five times by 2019. The growth could be larger. This would bring it to the brink of major status, and then I think there could be a significant change in attitude. Crash programs have a tendency to do just that (crash), as did the Synthetic Fuels Corporation, which tried to just what you are asking for in the late 70s and early 80s. The whole experience tainted the resource, and is constantly milked today by those who oppose development of oil shale. Oil shale can be ready when we really need it if we simply keep it on track, and the government does not stand in the way.